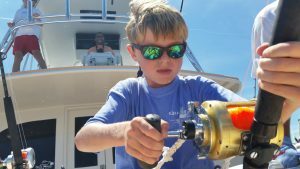 Hatteras Marlin Club Tournament June 25th–30th, 2017! A proud Jr. Angler! 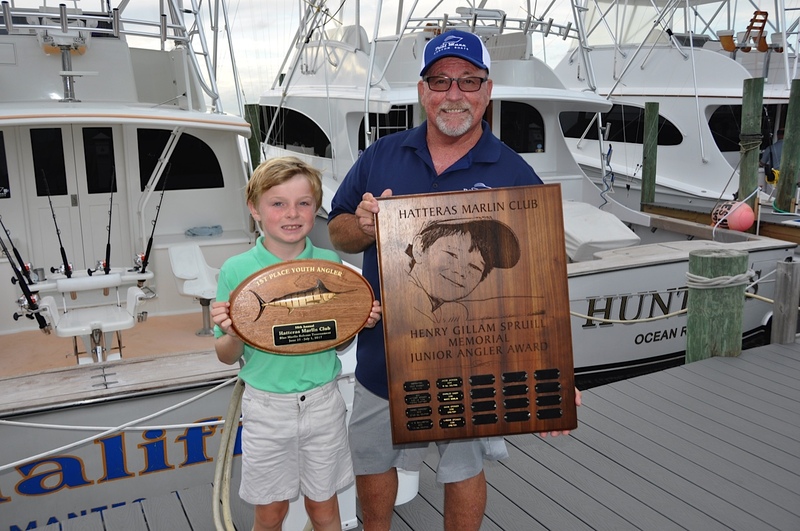 Young Charles Gaddy(left), fishing with team QUALIFIER, aboard the Paul Mann 56-foot, owned and captained by his father Fin Gaddy, captured the top Jr. Angler award at the Hatteras Marlin Club Tournament June 25th – 30th. The young man caught a blue marlin unassisted as well as two sailfish! The trophies were so large and impressive that young Charles needed help from Paul Mann himself (right) to show off the awards to the camera. Pretty work Charles Gaddy and team QUALIFIER! Great shot of young Charles Gaddy on the reel with a billfish hooked up in the Hatteras Marlin Club Tournament aboard the Paul Mann 56-foot QUALIFIER. That’s his father, Fin Gaddy, at the wheel on the bridge behind him.